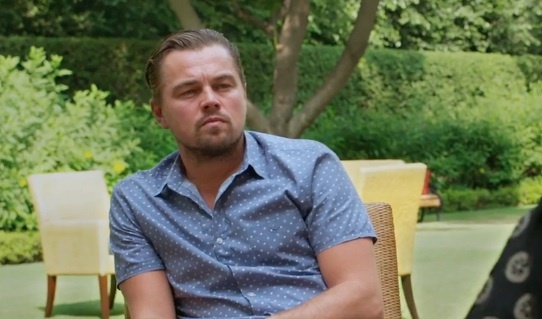 This week we reported that Leonardo DiCaprio was meeting with President Obama at the White House to discuss climate change, and that his documentary about the issue, Before the Flood, will be screened at the event. Now, Entertainment Weekly just let us know that there’s a trailer for the doc, and it looks both informative and polarizing (in a necessary way). "The U.S. has been the biggest emitter of greenhouse gasses in history [...] This is the most important issue of our time. The question is, can we change our course in time?" In the film, Leo meets with President Obama, Pope Francis, and various climate change experts to gain their perspective on what can be done to relieve the symptoms of climate change and pave the way for future generations. It sounds dire, but there is hope. "We’ve known about this for decades, for over half a century. Try to have a conversation with anyone about climate change, people just tune out. And the problem seems to be getting worse and worse and worse." Before the Flood comes to theaters on October 21st. It’s not going to be a walk in the park, but these are absolutely crucial issues that he’s addressing. We have to take care of our planet — and while that seems obvious, it’s also a huge undertaking that requires preparation and man/woman/human power. We’ll be watching this film, and hope you will too.